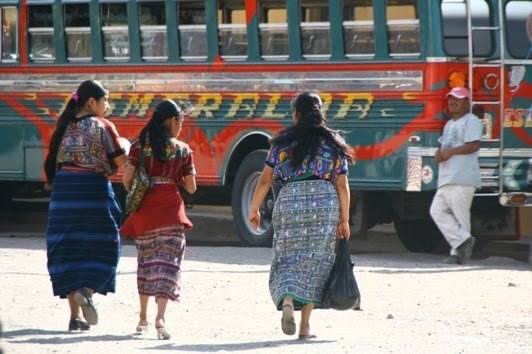 The buses in Guatemala are referred to as "Chicken Buses" because people take everything and anything with them onboard, including live animals. Once a U.S. school bus amasses 10 years of service or 150,000 km it is auctioned. 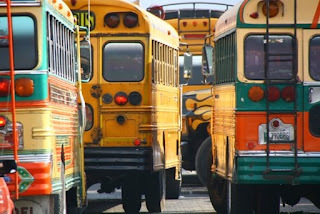 Many end up in Central America, where there are modified into the beasts of burden known as caminoetas, or Chicken Buses: a high-powered manual transmission is installed; they are shortened, to make them easier to maneuver on narrow roads; they are fitted with roof racks on the outside, luggage racks on the inside and air brakes; and the seats are ripped out and replaced to seat 6 people across. And let’s not forget the most redeeming feature... the paint job! [Above] The ayudante ("helper") is the man responsible for filling, and over-filling, the Chicken Bus with passengers. As the driver slows down to anyone, anywhere on the route, the ayudante hangs in the open doorway and yells out the destination in the most practiced, shrill, annoying voice possible. Each bus is run like a private business and is in direct competition with all the other buses, so whoever gets to the customers first gets their custom. Buckle up! 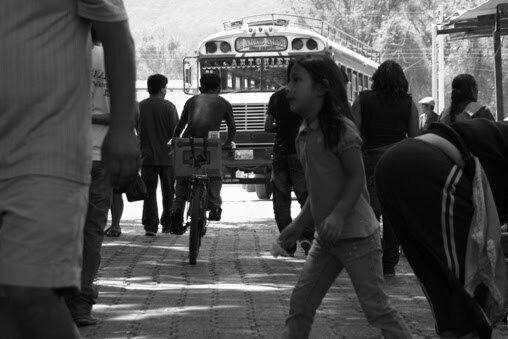 [Below] The bus terminal in Antigua, Guatemala is a hive activity, rich with smells and sounds and sights. Like most bus terminals in Central America, it attracts people in the masses, all trying to make some money from this grand union. It is a constant bustle of life, from within which you can find anything you so desire. Anything! After riding hundreds of buses in Latin America this December/January I am excited to say that I will be visiting Colombia for four weeks and this time my cuñado is letting me use his motorcycle for our trip to the Caribbean coast. No more dizzy bus rides, 18 degree ac on full blast and neck bending attempts at sleeping! That sounds like an AWESOME adventure! I wish I could go with you. I miss you loads, hermano.